I’ve been using technology to capture my kid’s antics since the day she was born, back in 2006 (the early days of blogging). I would use my video camera and iMovie to make home movies all the time. I’d spend hours editing and adding sound effects. Then I’d share the video via my personal blog and all my friends and family would wait for my weekly posts to appear on my website. Remember those days? Obviously, those were the days before homework, gymnastics and soccer practice. Sadly, I am not that blogging-and-movie-making queen anymore. 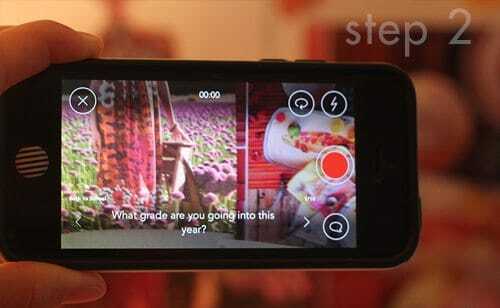 So you can see why a mobile phone app that can do all that fancy movie-making for me, would be so exciting? I’m all about my mobile phone these days. Who needs a laptop!?! I’m quite blown away by how easy it is and how professional the end result turns out. What’s it called, you ask? 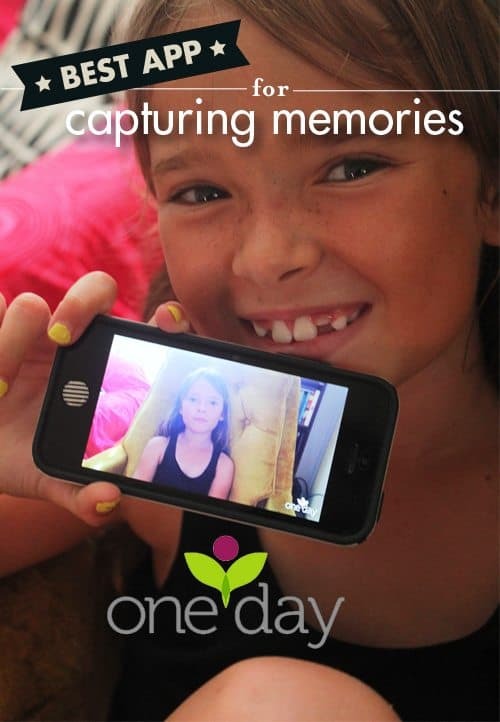 It’s the OneDay App. You can download it for FREE from iTunes. (Sorry Drones, you’ll have to wait a sec for this one to be available for you.) Install the app and Bam! Make movies. You, the parent, read the question at the bottom (or you can swipe left to pick a different question) and you hit the red record button when your kid starts talking. When s/he stops, you hit the button again to stop recording. You’ll know it’s recording because the little numbers at the top of the screen will begin counting. Then after each question, you can save and finish your video or you can hit “Add Another Moment” and keep asking more questions (and recording more of your kid’s answers.). 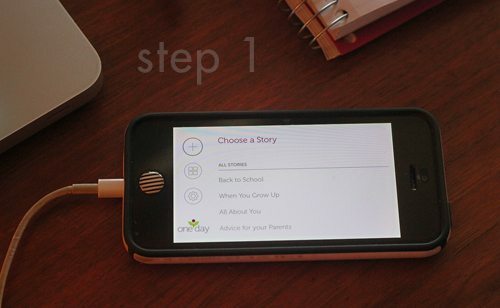 There are ten questions for each “story.” They are all really fun and cute questions. When you are done, you can save the movie to your photos in your iPhone for future use or you can share your movie via Facebook, Twitter or email. Just like that, grandparents connected! Isn’t that great? And what’s cool about this movie-making app is that there is music in the background making it even more professional in nature, like you have your own production crew in your pocket OR you are a blogging queen, spending hours and hours editing and all that. Heh. Funny how a little music can make the silliest of interactions seem a little more buttoned-up and put-together. And speaking of put-together, how put-together would you feel with a $500 Target Card? I know I would! Just click below to be entered in a giveaway! This post was written in connection with the Mom It Forward Blogger Network.